When President Obama signed an executive order last week to ease the debt burden on 5 million students "by capping repayments at 10 percent of the borrowers’ monthly income," he urged Congress to pass a Democratic bill that "would allow [another] 25 million borrowers to refinance student loans at lower interest rates," reported the New York Times. As widely expected, however, the bill, by Senator Elizabeth Warren, failed to get enough votes to be considered because it would have increased "income tax rates on the rich who make most of their money off investments," as NPR noted. "After the vote, Warren asked a pointed question of her colleagues: ... 'Who does Washington work for?'" San Francisco City College could get a two-year reprieve "to meet its accreditation standards" in what American Association of Community Colleges official called "a tremendous victory for the students of the college and the citizens of the Bay Area," according to the Chronicle of Higher Education. A California judge has ruled that teacher tenure laws, according to the New York Times, “deprived students of their right to an education under the State Constitution and violated their civil rights.” It’s a major defeat for teachers’ unions, and could radically change how the state’s teachers are employed, as well as set of challenges to tenure laws in other states. The case Vergara v. California was brought by a group of student plaintiffs backed by a Silicon Valley millionaire who argued that tenure had protected “bad teachers” and deprived them of a decent education. Teachers’ unions have called the Vergara decision “deeply flawed” and say the lawsuit is part of a corporate agenda geared toward privatizing public education. Read the American Federation of Teachers’ Truth about Tenure here. How do member-driven, democratic unions work as a team to make decisions about strategies and organizing? The topic, familiar to members of UPTE-CWA, is making national news this month in the Detroit-based journal Labor Notes. UPTE’s own Lisa Kermish, a retired UC employee who now serves as a full-time organizer in the union’s administrative professionals campaign, is among those interviewed on the nuts-and-bolts of how rank-and-file unions actually work. 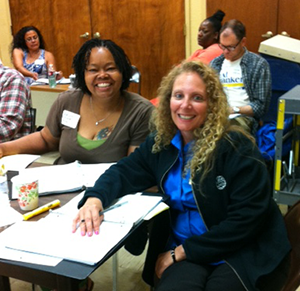 Members of UPTE and other CWA locals attend UPTE's annual arbitration training.